On the 1981 Oscars, Lucie opened the show headlining a chorus of 22 hoofers in a song and dance “Hurray for Hollywood” tribute. She’s also performed at the White House; and, in a twist of fate, just happened to be visiting the White House when President Obama opened the door for relations with Cuba, the homeland of her father, legendary TV producer as well as comedy icon Desi. Tickets for Lucie Arnaz, I Got the Job! Songs from My Musical Past, are $40 and available at the Tickets link at www.birdlandjazz.com. 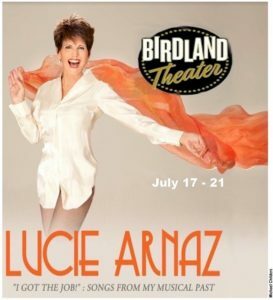 For more information on Lucie Arnaz, visit www.luciearnaz.com.